There's a lot to like in this new offering by Kalmbach. 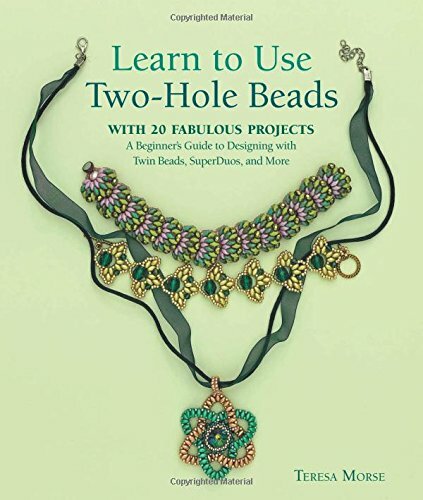 Teresa Morse has written a new book called Learn to Use Two-Hole Beads, which has not only a really good basics section, but also some great projects to work through your new skills. Just so you know upfront...the book concentrates on Super Duos and Twins, not on every shape of two-hole bead that there is. Of these, Super Duos are preferred for their more regular quality. In the very beginning of the book is a preview of all the projects, twenty two in all, which is great for finding your next project quickly. The basics section follows, and is essential, especially the techniques which show you how to organize the beads for a project, how to add and end threads, how to step up through two-hole beads, make beaded findings, and design with color. The project are divided by method of construction, design features, and materials. The simplest are individual beaded motifs that are stitched separately and then joined into beautiful jewelry, moving through more complex designs until you are adding layers and texture! I would love to win this very interesting book. Thanks! I have become more interested in 2 hole beads lately, and have bought them hoping I'll figure out what to do with them!! I'd love to win this book, thanks for the chance! This type of beading looks intriguing. The beaded star pendant is one of the most beautiful ones I've seen. I'd love to know how to make it. Thank you for the review and for having this giveaway. I've shared the giveaway on Pinterest. Oh that is a great book. It would really help me to fine tune my beading with super duo's. Thanks! I reposted your contest on FB...Thanks! OMG I would give anything to win this book as I am a beginning beader. I have been trying to learn different patterns with 2 hole beads. I just made my first order of 2 hole beads and do not have a clue where to start. e-mail ka.jun.bell@hotmail.com repost on FB,GOOGLE,AND OTHERS. I wrote to you once, years ago, and you were so kind and encouraging. Now I'm returning to beading after a long time caring for my husband as dementia diminished his life. I'd love to have this book. I would really like to learn more about the 2-hole beads and come up with my own ways to use them! Thanks for offering this book. I'm new at this and am loving the friendship.